SP6035 is a high performance and tightly integrated secondary side synchronous rectifier for switching mode power supply system. 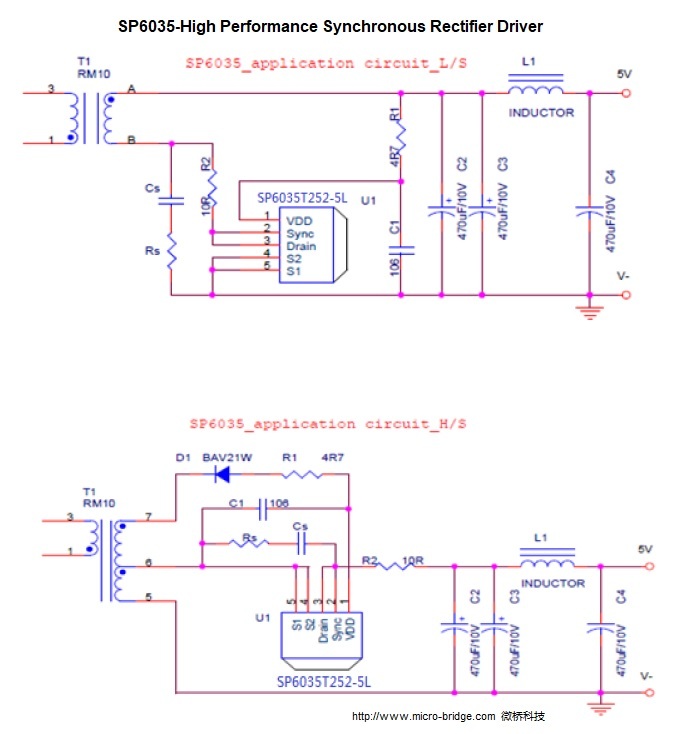 It combines a low Rdson N-channel MOSFET to emulate the traditional diode rectifier at the secondary side of Flyback converter, The fundamental of SP6035 synchronous rectifier (SR) driver IC is based on our U.S. patented methods that utilize the principle of “prediction” logic circuit. The IC deliberates previous cycle timing to control the SR in present cycle by “predictive” algorithm that makes adjustments to the turn-off time, in order to achieve maximum efficiency and avoid cross-conduction at the same time. The SP6035 is capable to adapt in almost all existing Resonance converters with no adjustment required. • Offers efficiency improvement over Schottky Diode. • Low Standby Power to meet DOE Lot 6 requirement. • Operating frequency up to 300 KHz. • Synchronize to transformer secondary voltage waveform.